Think she was trying to tell me something? Now, before you start writing nasty letters, e-mails, and such to my mother about her awful daughter, let me explain why I wrote this article. 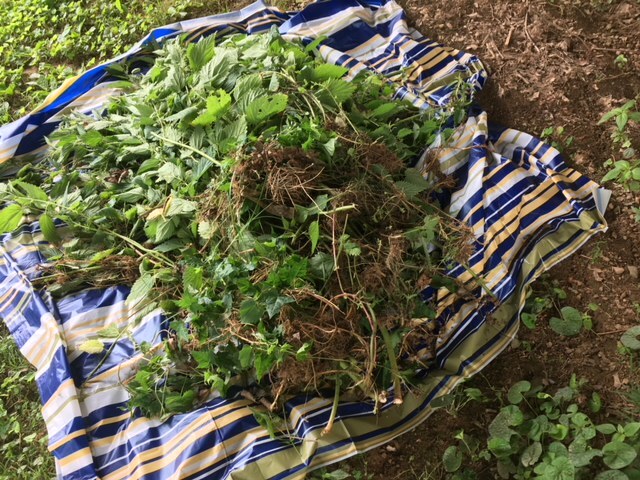 For as long as I can remember I’ve had flash backs about having to stop on the side of a highway and risk my life to grab a small unknown herb, wildflower, or berry for my mom. I’ve also remembered the days where instead of using regular medicines to cure my cold mom used “crazy voodoo magic”. This article is simply to show things you should avoid doing to spare your child from embarrassment and possibly permanent emotional and physical scarring even if you’re addicted to doing strange, sometimes smelly things in the kitchen with herbs from your garden. One of the things you may want to avoid doing is giving your child licorice root for their sore throats. I cannot tell you how many times I’ve been asked by my classmates “Why are you chewing on a twig?” or “Doesn’t that taste bad?” and I have many a silly nickname like, “hippie” or “tree-hugger” but every now and then “tree-eater” will come up. 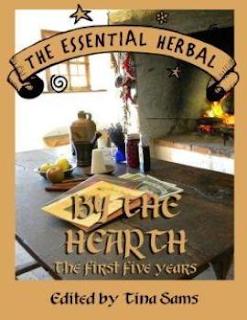 In fact, medicinal herbs and young children just don’t mix well at all. Once they get to be about eleven or twelve they will be fine with taking tinctures and what not but until then good luck trying to get them to drink it. I can’t count the wrestling matches mom and I had to get me to take anything (even “normal” medicine) and it usually ended up all over me instead of in my stomach. Another thing is going to herb festivals. I don’t have anything against them now and actually kind of like them so maybe other children (more girls than boys probably) will too, and if you go to one I’d suggest bringing your teenager. It gives you both a good time to bond and they may learn a lot from you or maybe you learn a lot about them. If you have a little one its risky bringing them because if they don’t have something to entertain them I promise you they’ll complain the entire time. But if you bring them you can teach them a lot. Show them stuff that smells, taste, or feels cool. I remember when I was a wee one I really liked lamb’s ear for example. Probably one of the most important things to remember is please do not use your child as a guinea pig. Your children love you very much and will do a lot for you but I know I speak for a lot of kids when I ask you not to put lavender oil on us to cure our sunburns. Another awful thing to test is how your homemade lotions, perfumes, soaps, and other neat stuff work. I’m very, very proud of my mom and all the nifty stuff she makes and its never happened to me yet, knock on wood, but some may have irritating and possibly painful reactions to some of the concoctions. Finally, yes, I know I told you more of what to avoid then what to do with your children when it comes to herbs so I guess I should tell you some good stuff about having an herb crazy mother. Please, if you want to show your kid how awesome herbs are and how much they can do, have them help or work with you on stuff. You can do a lot, go on a hike, or make some soap or something with them. If cooking is more your thing, you two can make some herbal tea or something crazy in the kitchen and have everyone eat it. 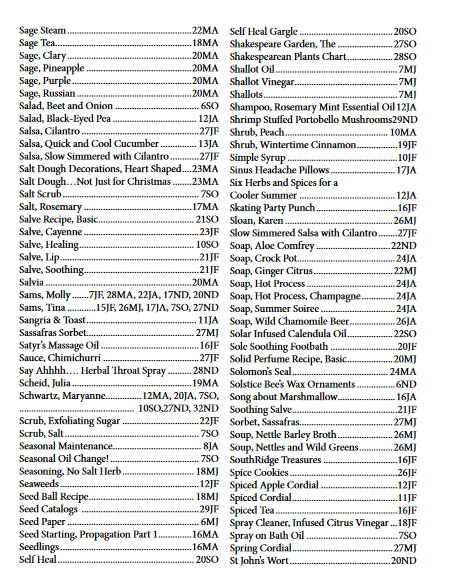 You can always have a totally organic and spiced up dinner or maybe have a party where you can all have friends over and decorate with herbs, make food with herbs, and maybe make a little gift bag with herbal bath stuff or other neat body stuff. That’s it for now. I hope you’ll enjoy and get ideas from this! 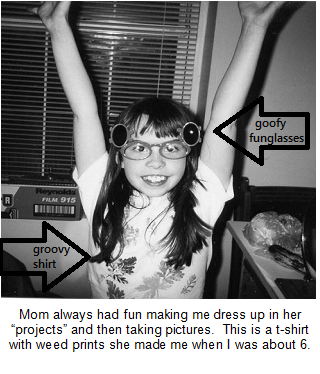 I thought it might be interesting to see how my daughter felt about her childhood experiences and told her not to hold back. Perhaps I should have re-thought that, being as she IS heading towards 16. 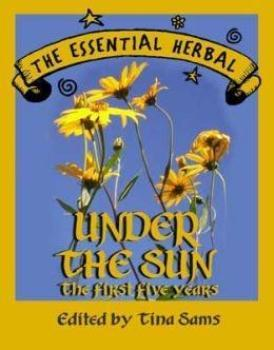 Additional note: At 20, she realized how much she loved herbs and began studying them in earnest. Still going strong at 27. Because this gets such rave reviews, we're sharing this recipe from (Jul/Aug '18) the current issue. I have always loved ANY kind of Mexican food. I don't know how many Mexican restaurants I've been to in my life, all over the Pacific Northwest. But I never tried Mexican Cabbage Salsa until we moved to the Wenatchee area. At every Mexican restaurant here, the warm-up is hot Tortilla Chips, Tomato Salsa and Cabbage Salsa. (Technically called Cabbage Salad, but the flavors scream Salsa) I had to learn to make it because it is fabulous served with Tortilla Chips! It is a staple at my house in the summertime. First, go out to your garden or the Farmer's Market and grab a cabbage. Cut away all the green leaves, wash, and gut the tough center core. Shred, either by hand or in a Food Processor. Combine all ingredients together, adjusting to suit your taste, and refrigerate about 2 hours to allow flavors to blend. Serve with warmed tortilla chips to your very favorite people! We've had the three big books for quite a while now. In fact, it's getting to be time for another, but we have to work up the energy to put it together and rustle up the cash to print it. 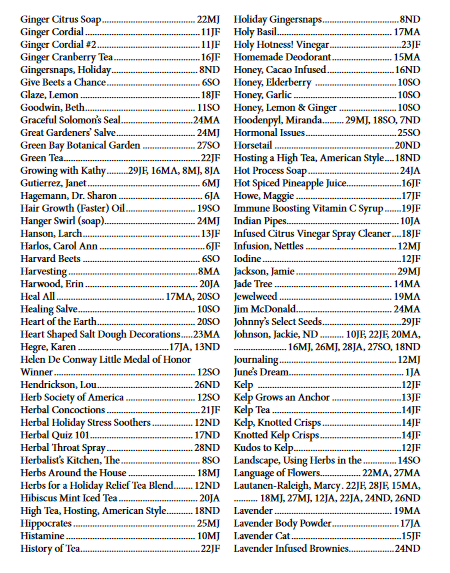 In the meantime, I JUST figured out a way to share the indexes so you can see all the amazing content they hold. The table of contents just don't do them justice. To make these books, we completely deconstructed the magazines, then we repositioned all the information, creating meaningful chapters. 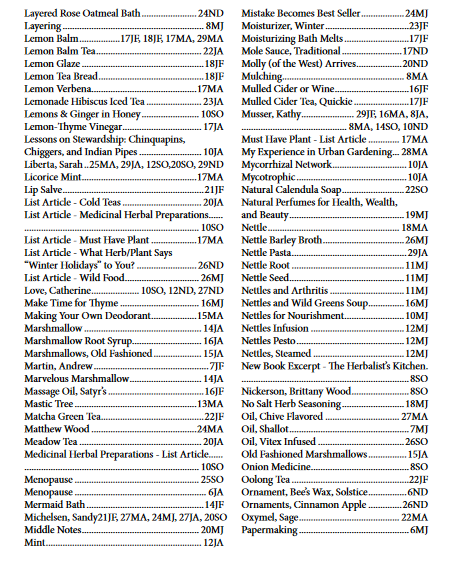 Monographs, medicine, teas, bath and body, and food, along with lore and history, make these books really wonderful. So full of ideas for bringing herbs into your every day around the home. Our first compilation. 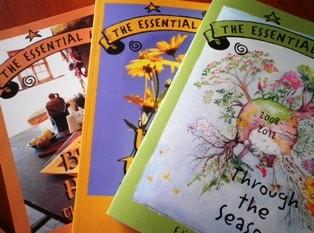 5 years (2002-2006) of Spring and Summer issues. Yes, the years on the cover are incorrect. They are a great deal. 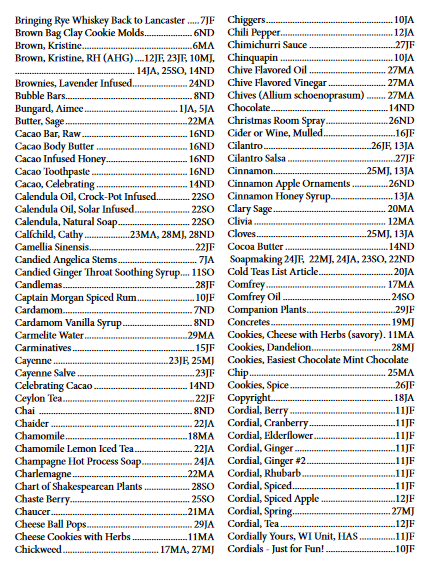 It's been said that the indexing alone is worth the money - just to be able to find things! So have a look. We're sure you'll be needing one, two - or for the very best deal, all three. For 12 years, I've tended the clematis that was my mother's. 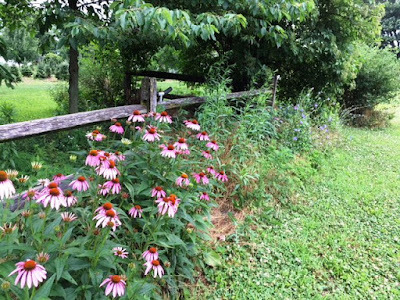 She planted it here when she first moved in, and loved the deep, vibrant, violet flowers that climbed up a little lattice. Flowers growing outside were a big deal to Mom. She wasn't good with plants. We learned never to give her houseplants, and if we gave her bouquets for special occasions, we could be sure to find them perfectly (kind of) preserved, still in their vase weeks later. She took an interest in plants when she moved up here, and some of her plants remain. I really dislike "red hot pokers" but can't bring myself to tear them out. 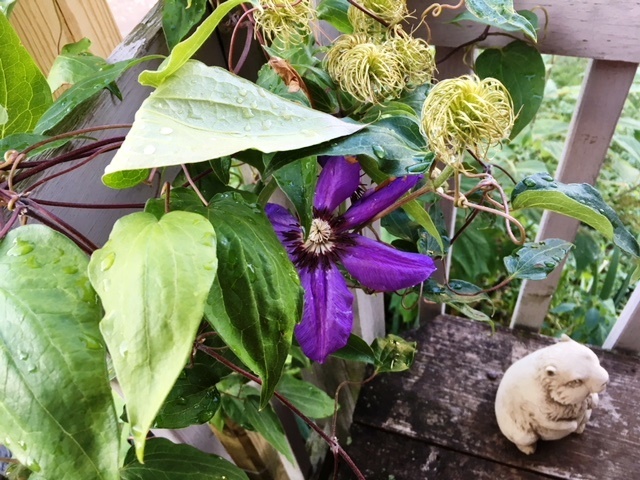 There were several things here that she loved, but the clematis was "her color." When I got here, it barely bloomed. 3 or 4 blossoms a year for the last 11 years, and then this year something changed. It started climbing, and I gave it some ribbon to find its way to the porch railing. On it went, blooming all the way. I appreciated every single flower. As it got closer and closer to the date that the kids were to arrive from California, I told the clematis that they were coming; to hang on. It's about time for them to leave. I went out on the porch for something and saw this one lone flower left. No more buds, and the petals are barely hanging on. It did its job. 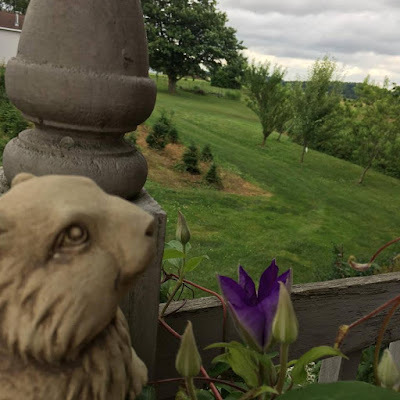 If you knew how much these kids meant to Mom, you would be right there with me, knowing that the clematis flowers this year are from her, and she too stuck around to be with the kids. I knew it when one of the petals drifted to the ground while I stood there looking at it. I'm not sure if the tears that filled my eyes were about the kids leaving, thinking about how proud she'd be of them, or the whole kit and kaboodle. Dang flower. From the very beginning, we've paid extra postage in order to be informed by the post office if subscribers move. In order to obtain that benefit, we also had to accept the part where any magazines returned as undeliverable for any reason cost about 2.5X the first class rate. That is currently $4.02. The returns always come in after the next mailing goes out, so that means $8.04. Sometimes situations can bring in a third issue. Since we profit a good bit less than 50% of the subscription price, I'm sure you can see how this has become untenable, and we have had to cancel subscriptions on occasion. We can only ship it where it is ordered to go. That's where our responsibility ends. With the Sept/Oct issue, we will be ending that benefit. Subscribers will be responsible for notifying us of a change of address. If the customer does not receive magazines and we have been shipping to the provided address, we have no further liability. Sometimes there are errors on our part, and we will gladly accept responsibility if that is the case. So please. Let us know when you move and notify us if you don't get a magazine. Thank you. 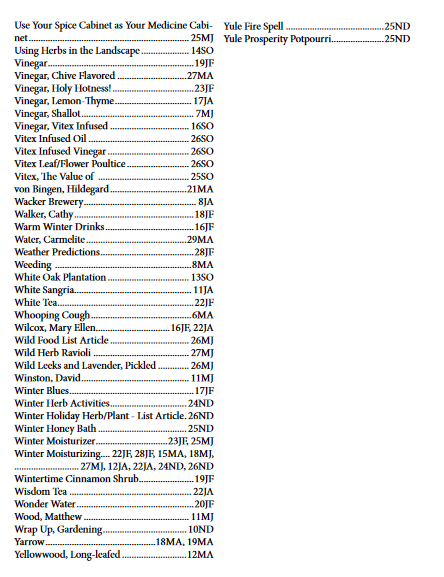 We decided to put together yearly indexes until we get around to deciding whether to do another compilation, or what we want to do with the now 7 years of magazines that have not been compiled in books like Under the Sun, By the Hearth, or Through the Seasons. 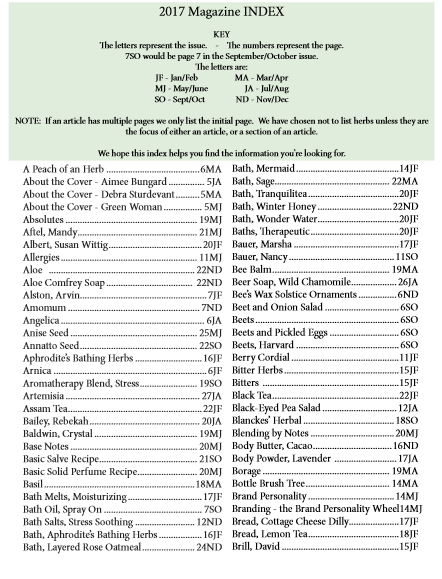 An index is helpful in looking for that recipe or article or writer or reference... you get my drift. 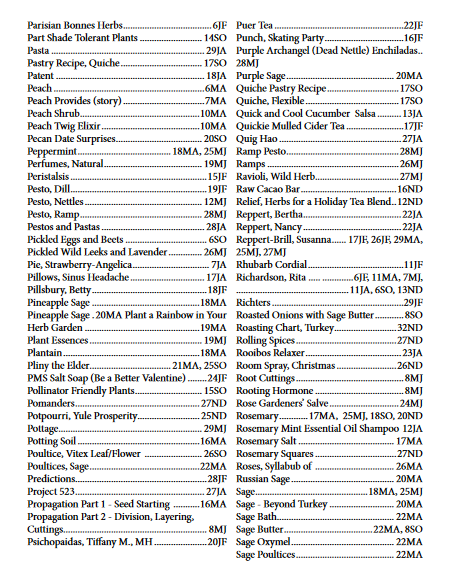 If you've ever wanted to get some idea what we can fit into the pages of The Essential Herbal, this may be an eye-opener! 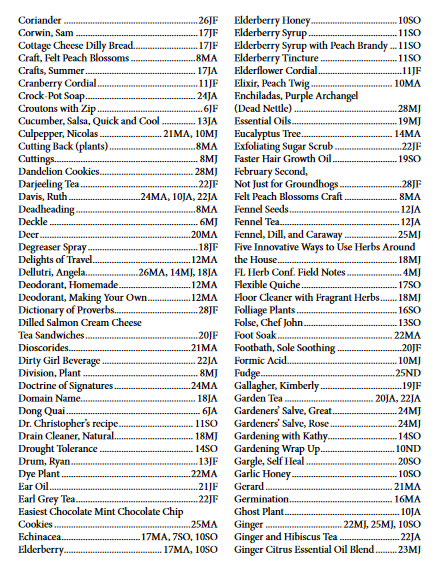 I have no real recipe, as I tend to just grab a mix of various mints when making a garden tea. But I was just remembering that if a replica of black tea is desired, both Wood Betony and Red Clover give that base or body to a mix. 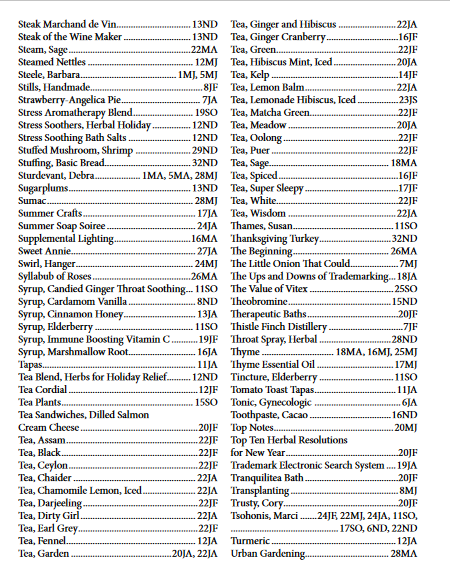 For each serving of tea, use 1 tsp. mix to 1 cup boiling water. Add some honey, if desired. Store in fridge for a delicious iced tea. This recipe is from dear old Mom (Bertha Reppert). It is slightly adapted from her booklet Herb Teas for Pleasure. Place above ingredients into a quart container. Pour 2 c. of boiling water over them. Steep 10 minutes or more. Strain. Add 2 c. of iced water. Light and refreshing! Enjoy! 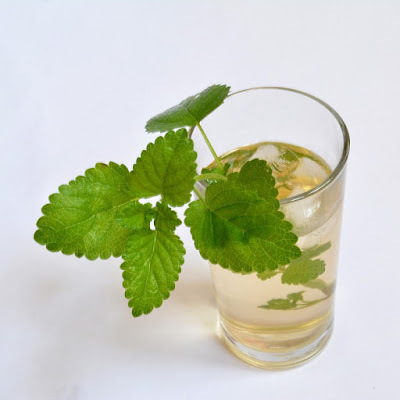 Option: To make a Lemon Balm Spritzer, instead of adding 2 c. of iced water, let strained mixture cool and add a 20 oz. bottle of chilled ginger ale. I love lemon herbs in tea and these are my favorites. 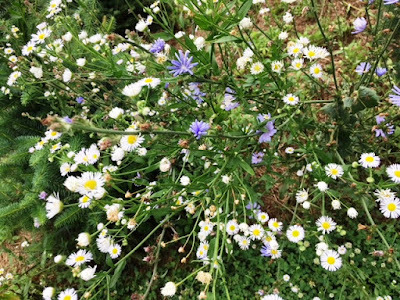 Chamomile with its gentle apple flavor when combined with Lemon Herbs makes a great summer iced tea. 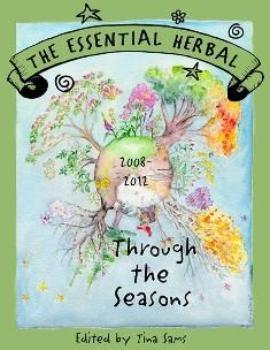 I use a combo of lemon herbs, like lemongrass, lemon balm, lemon thyme, lemon verbena and lemon scented geranium leaves. Bring water to boil then add chamomile and lemon herbs. Allow to steep 10 minutes. Strain out herbs and add honey and allow to cool before adding ice and serving. Bring water to boil and steep hibiscus in water for 30 minutes. Remove hibiscus and allow to cool completely. Place strawberries and sugar in a saucepan and warm until they start to break down, about 25 minutes. Run through a sieve and allow juice to collect in the pitcher with hibiscus tea. Try not to press on strawberries or this will cloud the tea. Add lemon juice and simple syrup to pitcher and stir. Cover and refrigerate up to 3 days and serve over ice. This is amazing after a day in the garden! And you can add a dash or two of gin or vodka too if the garden work is done. Basil and summer are meant to be together. Nearly 10 years ago, a publisher approached me about a book and asked for one (very small) chapter to take to the Book Fair in Germany to see if it would fly. It didn't. Today I was searching for something, and found the file from that writing sample, and thought I'd share some of it with you. 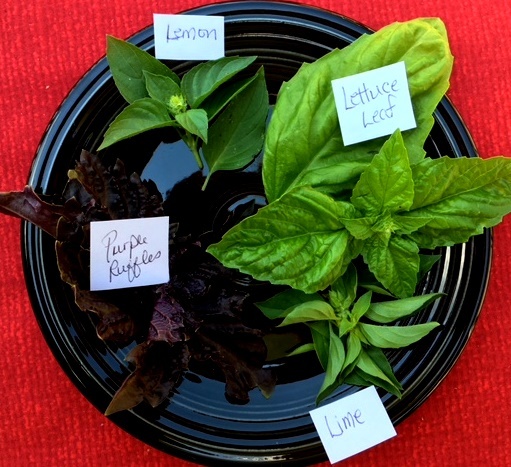 The mouth-watering aroma and taste in Italian dishes is usually what we associate with basil, but the popular round-leaved, emerald-hued "sweet" basil is just the beginning. Green Lettuce Leaf or purple "Ruffles" can be mixed into salads with delicious results. Purple, Opal, or Cinnamon basils make a tasty ruby-red vinegar easily by simply filling a jar loosely with their leaves, and covering for a week with rice wine vinegar. Strain and bottle for use all during the year. Lemon and Lime basils are divine with chicken or fish, and the spicy Globe basil is a pleasure for indoor gardeners, growing well on sunny windowsills. Greek Columnar basil is carefree to grow, as it never bolts or flowers. Thai basil, African Blue basil, Licorice, Holy basil... there are so many to love! The name of this herb may be derived from the mythical reptilian creature, the basilisk, that was capable of striking one dead with a mere glance. In superstitious medieval times, it was spurned and dreaded because it was believed that basil plants drew scorpions with their scent and the act of smelling basil would draw the creatures right into the brain. It's not all bad, though! In Italy, basil symbolizes love, and a man may present a would-be lover with a sprig. In the Greek language, basilus means "royal", and is considered by many to be "the king of herbs". In the language of flowers, basil means "best wishes". 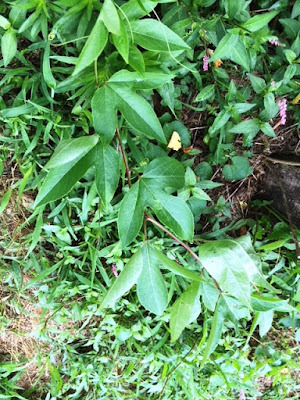 Nowadays, it is one of the most popular herbs in the world. PESTO is one of the simplest and most elegant of summer meals and the recipe is very forgiving, allowing one to use handfuls to measure. While the pasta cooks, gather a good handful of fresh basil leaves. Toss them together with a clove of crushed garlic, a handful of good Parmesan cheese, another handful of walnuts or pine nuts, and enough olive oil to moisten well. Process to a slightly chunky, green paste. Serve over piping hot pasta, alone or with shrimp or chicken. Some crusty bread, a little white wine, and in 15 minutes, you have a luscious culinary masterpiece. Be sure to make plenty of pesto during the summer and freeze it in meal-sized portions for a delicious green reminder of summer gardens in the dark months of winter. A cup of basil tea after dinner can be relaxing and beneficial to digestion, relieving bloating and gas. To each cup, add 2 or 3 basil leaves and cover with boiling water. Allow to steep 3 to 5 minutes. 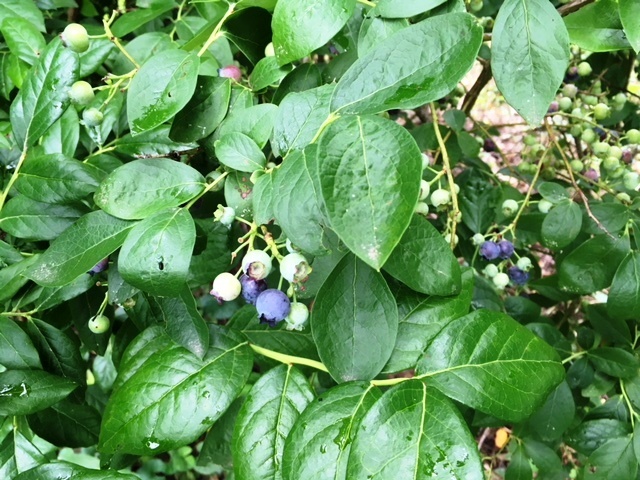 From mid to late June until the 4th of July, I pick berries twice a day. My freezer is full of raspberries, blueberries, black currants and gooseberries. I lost (???) my canner, so I'll be on the hunt at yard sales so there will be jelly eventually. There are still some blues, but the birds can have the rest of them. Today I went out there, and it seemed like I was seeing everything else for the first time. Except for the flower garden outside my bedroom window, everything else has been ignored. It was exciting to see, and if you'd like to come along, we can take a little tour. The birds are possessive about these and set up quite a racket when I walk near. 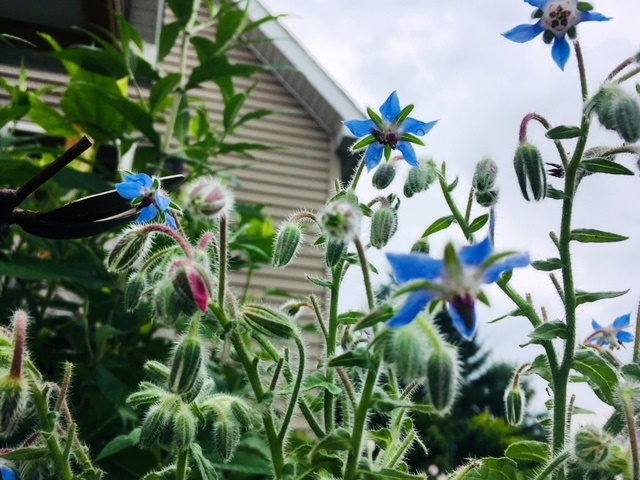 Right outside the door, the borage is setting off fireworks of its own. I swear, the echinacea was barely budding last time I saw it. 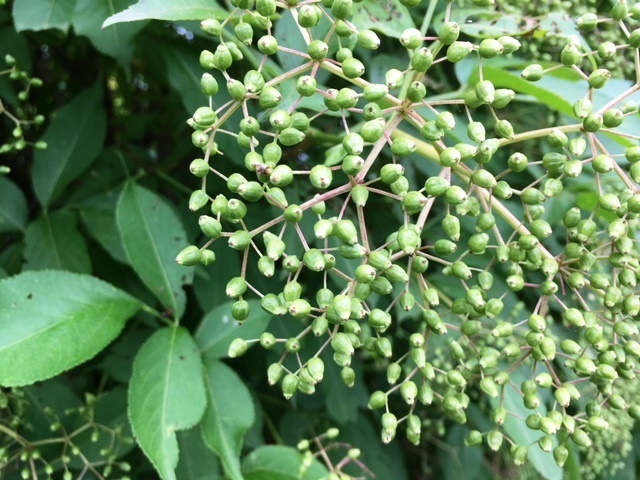 Baby elderberries are looking good so far. 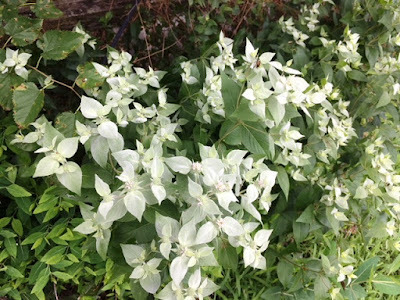 On the other bush across the yard, beetles have done a number on the leaves, so I'm interested to see how that is going to turn out. More circulation might mean fewer fruit flies. Maybe? Fleabane daisies and chicory cozy up to a little balsam fir in the field. The fields are filled with masses of these along with drifts of Queen Anne's lace between the trees. They are mowed periodically, but so pretty. And they grow back. 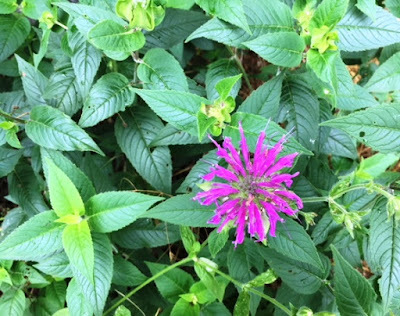 Monarda is starting to bloom in the back, but not yet in the front. Mountian mint! Lush and healthy, it's been a couple of years since it took a turn in the still. We'll remedy that soon. Oh yeah... the reason I went out was to harvest some nettle seeds. This patch was a 4" pot 3 years ago. The bare area in the picture is what I wound up pulling. Those roots! Those stings! What an exciting hour! Jewelweed grows right next to it and really came to the rescue. Shorts and t-shirt are a poor choice for this work, by the way. This is what I pulled, and it isn't quite done yet. This is a full-sized shower curtain. Nettle roots are really incredible. Tenacious... sneaky... strong... I'll have to do this every year. I was beginning to think the passionflower was not coming back, but low and behold, there it is! Instead of 100 shoots, I only found 2. This was a rough winter. 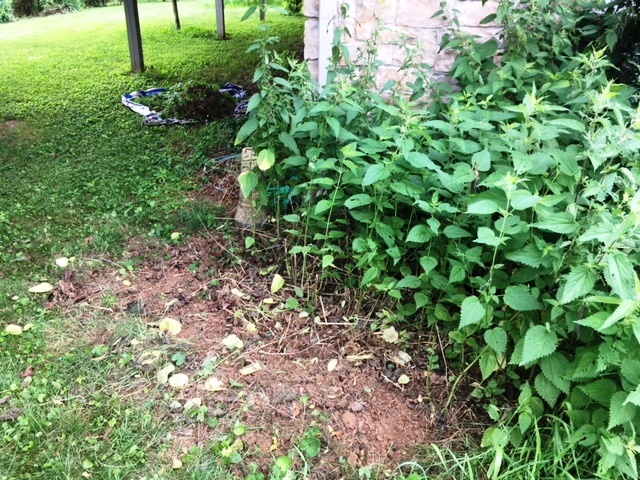 Almost all of the lavender died, and one of the figs. Guess it was rough for the passionflower, too. 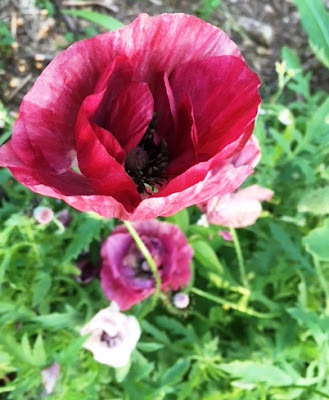 I planted poppies all over the place in all kinds of varieties. I am completely in love with them. 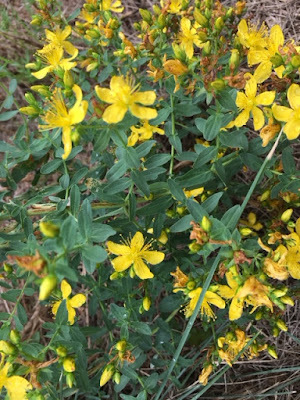 Finally, I was walking past the raspberry patch and thinking about how this seemed to be one of the years when no St Johns wort would be coming up. Sometimes there's lots, sometimes there's none. I looked up and there was a glimmer of gold off to the right! It looks like rest of the summer will be pretty exciting. In the last 12 or 13 years, so many different perennials and "planned weeds" have been added to this plot of land that I don't remember them all, and get pleasant surprises almost every time I walk through the yard! Here's hoping that you're enjoying the plants in your surroundings too!